Ohio tangler Joan Stark is back today with her Spring-like El-oh-el tangle. Not unlike Abeko, but a little different, Joan notes it’s also similar to LO’s and Looby-Loo. I work part-time as a pool supervisor at the local recreation center. I open the pool several days of the week clocking in before 5am. I’m on my own with the swimmers until 9am. I get some time to think and randomly draw on my notepad. I was playing with circles and loops. I may have seen something funny and unconsciously wrote “lol”. This tangle is a story about the “lol”. I don’t think it’s possible to feel unhappy or down about anything while laughing out loud. So I felt very positive drawing this tangle and found myself smiling as I watched the lol-ing develop. I hope that this tangle does the same for other people. It starts easy enough with a row of medium-to-large orbs. These are the O’s. Next I added a loopy cursive “L” between each of the orb starting at the BOTTOM of the orb. We now have lolololol’s. Turn your paper upside-down and add more loopy cursive “L”s again starting again at the BOTTOM of the orb. Either way you look at it, you are ‘laughing out loud’ multiple times. You can stop right there.. or continue. To fill in empty spaces, I liked adding rice shapes on each side of the loopy “L”s — top and bottom. And them embellish and shade as you like! And there are soooooo many variations. The example in the step-out shows the tangle as a radial design in the center of the page. The rest of the example shows multiple lines of “EL-OH-EL” using some of the possible variations – different size orbs and loops, different spacing between lols, and lots of embellishments. See if you can find the “lol”s in each border sample! 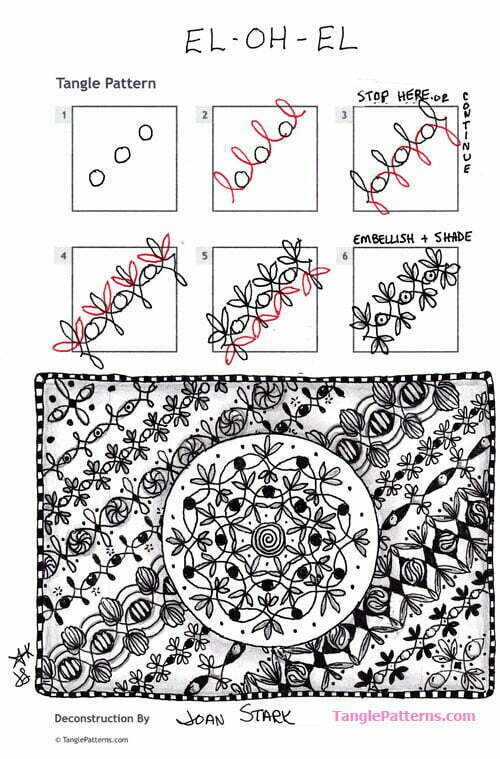 Joan illustrates the step-by-step instructions for drawing El-oh-el below and she features it and a host of variations in a ZIA. What a sweet and happy tangle!! Makes you smile!??? Love it, Joan! Thanks for sharing. Must try it Joan. Thanks fo posting. Fun and smiling. Happy tangles always welcome. I want to clarify that I *DO* watch my swimmers. I don’t want anyone to think that I neglect them in order to tangle. That would be unsafe. Instead of twirling my whistle, I let my pen do whatever it wants on a notepad– usually without looking at the result until later. What a fun tangle. It reminds me of when I used to teach cursive writing. I would teach lots of ‘pattern drawing’ as my class practiced their loops and circles, a happy memory of my teaching days. So sad that cursive writing is hardly taught now if at all! very relaxing and beautiful tangle to draw!